We wish they had a cupcake tree. Even the first lady wants you to be good and eat your veggies. 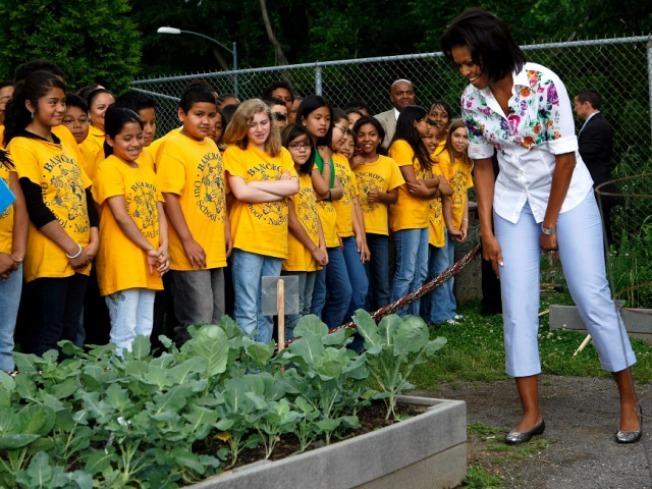 The White House is now offering tours of its Kitchen Garden. However, unless you're a student in a local elementary, middle or high school, you're plum outta luck. The tours will only be offered to area school kids right now. White House chefs will offer tours of the South Lawn's garden, a peek at the beehive and tips on healthy eating. The tour will not include a stop inside the White House. Interested groups will need to complete an application between one and three months in advance. Tours will be offered most Tuesdays and Thursdays at 11:30 a.m.
"We wanted the focus to be on kids, because you can effect children's behavior so much more easily than adults, and I saw that in my own life," said Michelle Obama in a video produced by the White House. "My kids jumped on the new routine and didn't miss a beat, and they began to monitor our behavior moreso than I was monitoring theirs," said Obama. The first lady broke ground on the White House garden -- with the help of local schoolchildren -- in the spring. Since then, White House visitors and local food pantries have enjoyed hundreds of pounds of fresh, locally grown veggies.